Quantum Leap: Fuel Consumption Reduced by around 30 Percent. 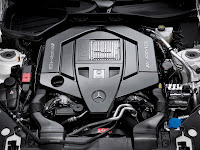 Affalterbach – Mercedes-AMG has developed a new 5.5-litre V8 engine which combines powerful eight-cylinder performance with the decidedly economical fuel consumption of a four-cylinder. Unrivalled efficiency is achieved thanks to the AMG Cylinder Management cylinder shut-off system newly developed by Mercedes-AMG. This new technology exclusively developed by AMG is inspired by Formula 1 racing. In the eight-cylinder racing engines developing around 750 hp, cylinder shut-off is likewise used primarily to save fuel. Thanks to a fuel saving of around 30 percent compared to the existing AMG 5.5-litre V8 engine, the naturally aspirated, high-revving eight-cylinder demonstrates the great innovative strength of AMG. At the same time it is AMG's demonstration of the potential still residing in the naturally aspirated eight-cylinder engine. The distinctive AMG 5.5-litre V8 engine with AMG Cylinder Management and direct petrol injection will find exclusive use in the new SLK 55 AMG, which will celebrate its world premiere at the International Motor Show (IAA) in Frankfurt/Main in September. This means that the latest version of the SLK 55 AMG will remain the only roadster in its segment with an eight-cylinder engine. Even with peak output increased by 45 kW (62 hp) to 310 kW (422 hp) and torque increased from 510 to 540 newton metres, the fuel consumption of 8.5 litres per 100 kilometres (NEDC combined, provisional figure) is 3.5 litres less than that of the preceding model – a real quantum leap of around 30 percent which places the new SLK 55 AMG among the top performers in its segment. CO2 emissions have likewise been considerably reduced, as witness the figure of 199 grams per kilometre (NEDC combined, provisional figure). In line with its "AMG Performance 2015" strategy, Mercedes-AMG is meeting its promise to continuously reduce both the fuel consumption and emissions of new models over the next few years with the new V8 unit – while reaching new heights with the central brand claim of "Driving Performance". Moreover, the performance brand within Mercedes-Benz is also demonstrating its social commitment with the M152. The new M152 is based on the AMG M157 5.5-litre V8 biturbo engine presented in 2010, which powers the E 63 AMG, CLS 63 AMG, S 63 AMG and CL 63 AMG. Numerous components and systems are basically identical, e.g. the displacement, bore/stroke, distance between cylinders, stop/start system and direct petrol injection technology. Distinguishing features versus the M157 include the new intake air ducting, new cylinder heads, the modified valve drive, an adapted oil supply system and an optimised crankcase. "Top performer for fuel economy and maximum output: with the new 310 kW (422 hp) AMG 5.5-litre V8 engine we have once again created a real masterpiece. The M152 sets an outstanding example for efficiency, while demonstrating the creativity and expertise of our engineers, who took their inspiration from Formula 1 when developing the cylinder shut-off system. This makes the new, naturally aspirated eight-cylinder the perfect power unit for the new SLK 55 AMG, which will celebrate its premiere at the International Motor Show in Frankfurt/Main in the autumn," says Ola Källenius, Chairman of Mercedes-AMG GmbH. "Thanks to the innovative AMG Cylinder Management system and other high-tech components, our newly developed AMG M152 naturally aspirated eight-cylinder engine achieves the fuel economy of a four-cylinder with the muscular power delivery and emotional sound experience of a V8. 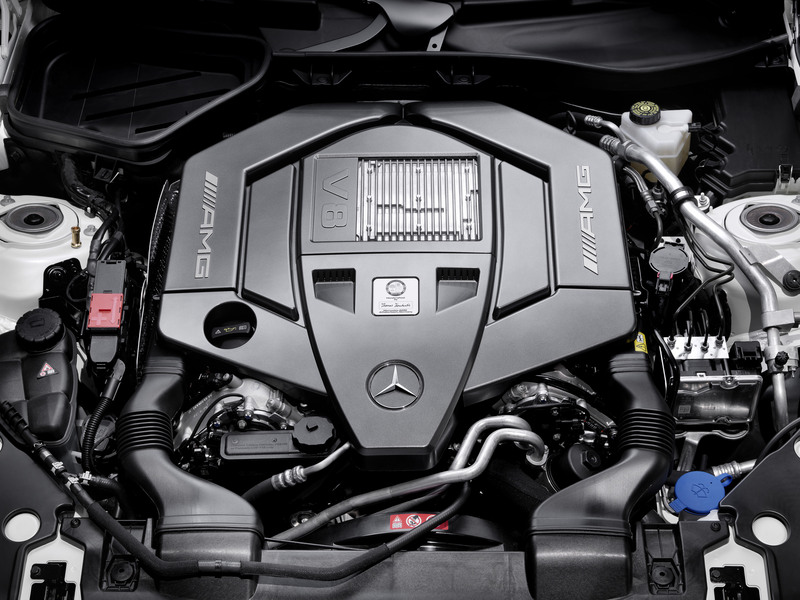 A sports car engine with technology taken from Formula 1 – I am convinced that the new SLK 55 AMG will meet the high expectations of all sports car fans," says Friedrich Eichler, head of powertrain development at Mercedes-AMG GmbH. The high-tech M152 powerpack not only enthrals with its extraordinary power delivery and torque, but also thanks to a combination of advanced technologies which is unequalled anywhere in the world. No other petrol engine features direct injection at a pressure of 200 bar, spray-guided combustion and piezo-injectors in conjunction with map-controlled cylinder shut-off, an all-aluminium crankcase with "spectacle" honing, four-valve technology with continuous camshaft adjustment, a high compression ratio of 12.6 : 1, a stop/start system and generator management – while revving to a maximum of over 7000 rpm. All these design features lead to high thermodynamic efficiency, which is in turn the precondition for high fuel efficiency and low exhaust emissions. Moreover, deciding in favour of a large-displacement, naturally aspirated eight-cylinder unit with cylinder shut-off resolves the conflict of aims between high output/torque delivery and decidedly low fuel consumption figures. It is the AMG Cylinder Management cylinder shut-off system in particular, completely newly developed by Mercedes-AMG, which significantly improves efficiency: cylinders two, three, five and eight are cut off under partial load, which considerably lowers fuel consumption. In similar form this technology is also used in the approx. 750 hp V8 engines used in Formula 1. As efficiency also plays a major role at the pinnacle of motor racing, two or four of the eight cylinders are cut off e.g. when cornering at slow speed, in the Safety Car phases or for pit stops. With a fuel consumption of 8.5 litres per 100 km and CO2 emissions of 199 grams per kilometre (NEDC combined, provisional figures), the naturally aspirated AMG V8 engine comes in at or below the level of its competitors, however these are unable to match either the output or torque of the SLK 55 AMG – and above all, they do not use large-displacement eight-cylinder engines. The cylinder shut-off function is available over a wide engine speed range from 800 to 3600 rpm if the driver has selected transmission mode "C" - Controlled Efficiency. The AMG main menu in the instrument cluster informs the driver whether cylinder shut-off is active, and whether the engine is currently running in four or eight-cylinder mode. No less than 230 newton metres of torque is still available in four-cylinder mode – enough power to ensure plenty of acceleration in most driving situations. As soon as the driver has a need for more power and leaves the partial load range, cylinders two, three, five and eight are activated. The switch from four to eight-cylinder operation is immediate and imperceptible, leading to no loss of occupant comfort whatever. At an engine speed of 3600 rpm the activation process takes no more than 30 milliseconds. This is made possible by intelligent interaction within the highly effective engine management system, with 16 hydraulically compensating elements and a complex oil supply system in the cylinder head. The selectable compensating elements are integrated into the cylinder heads, and keep the intake and exhaust valves of cylinders two, three, five and eight closed. At the same time their fuel supply and ignition are deactivated. This not only enables the load-change losses of the four deactivated cylinders to be reduced, but also increases the efficiency of the four remaining cylinders. This is because the operating point is transferred to the higher load range. The compensating elements are compact and lightweight, allowing taut valve train operation and engine speeds up to 7200 rpm. The crankcase of the new AMG 5.5-litre V8 engine is of diecast all-aluminium construction. The low (dry) engine weight of just 187 kilograms is the result of uncompromising lightweight construction methods. The bearing covers for the main crankshaft bearings are of grey cast iron, and are bolted to the crankcase, as well as on the sides, for high rigidity. The piston rings are carbon-coated to minimise internal friction and optimise the wearing characteristics. Cast-in Silitec cylinder liners ensure low friction for the eight pistons. So-called "spectacle" honing is another measure to reduce friction and therefore fuel consumption: in this sophisticated and complex process, the cylinder liners receive their mechanical surface treatment when already bolted in place. As honing would no longer be possible with the cylinder head installed, a jig resembling spectacles is bolted to the crankcase. The cylinder liners distort as if the cylinder head were in place, and are only then given their mechanical surface treatment. As a result, any static distortion of the cylinder liners caused by tightening the cylinder head bolts can be completely eliminated. The forged crankshaft of high-grade 38MnS6BY steel alloy rotates in five main bearings, has eight counterweights and has been optimised with respect to torsional rigidity, inertia, low rotating masses and a long operating life. A two-mass viscous damper mounted at the front reliably eliminates vibrations. Each connecting rod journal on the crankshaft carries two forged, cracked connecting rods. Perfect charging of the combustion chambers is ensured by large intake and exhaust valves, of which there are four per cylinder. 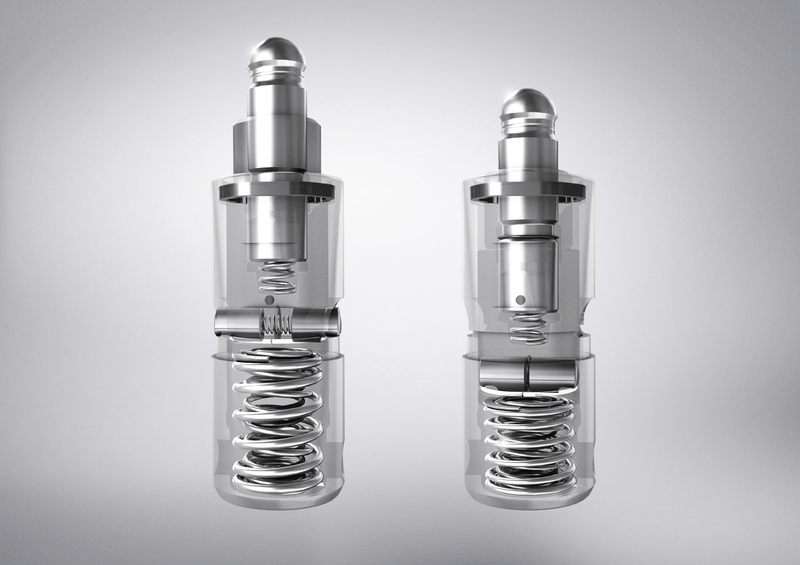 The exhaust valves, which are subject to high thermal loads, are hollow and sodium-cooled. 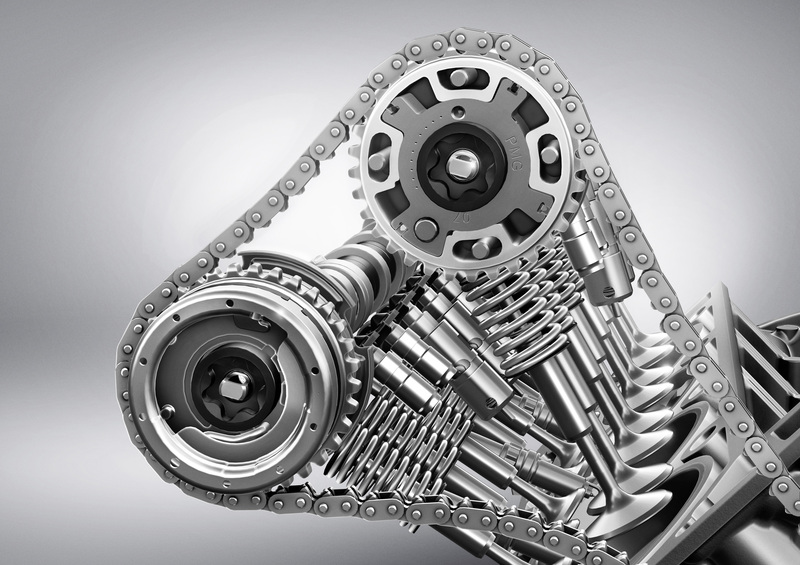 Four overhead camshafts operate the 32 valves via low-maintenance, low-friction cam followers. The infinitely variable camshaft adjustment within a range of 40 degrees on the intake and exhaust sides depends on the engine load and engine speed, leading to outstanding output and torque values. This also results in consistent idling at a low speed. Depending on the engine speed, valve overlap can be varied for the best possible fuel/air supply to the combustion chambers and efficient removal of the exhaust gases. The variable camshaft adjustment is carried out hydraulically via four pivoting actuators. These are electromagnetically actuated and controlled by the engine control unit. The camshafts are driven by three high-performance silent chains, which have considerable advantages in noise comfort compared to cylinder roller chains. The Controlled Efficiency stop/start function further contributes to the low fuel consumption. This system is standard equipment in the new SLK 55 AMG, and permanently active in the fuel economy transmission mode "C". Once the driver comes to a halt e.g. at a red traffic light, the V8 engine is automatically switched off. Once the brake pedal is released or the accelerator is depressed, the engine is immediately restarted and the car is able to move off quickly. Intelligent technology guarantees a comfortable and immediate starting procedure: a crankshaft sensor which recognises the direction of rotation registers the resting position of all eight pistons. For an automatic engine start, the cylinder with the most favourable piston position receives an injection of fuel into its combustion chamber. The precise piezo-electric injectors greatly assist this process, as they make particularly fast starts possible. The M152 always starts in eight-cylinder operation. The engine management ensures that the engine is only switched off if certain preconditions are met. The starter battery must have sufficient charge, for example, and the engine must be at the necessary operating temperature for efficient emissions control. The same applies to the interior temperature selected by the driver: if this has not yet been reached, the engine is not switched off when the car comes to a stop. The onboard network management system makes sure that active audio, telephone or video functions are not interrupted by the stop/start function, and that the air conditioning continues to operate. A framed "ECO" symbol in the AMG main menu shows the driver that the Controlled Efficiency stop/start function is active. When cylinder shut-off is active, the driver is informed by the symbol "ECO4", while "ECO8" stands for eight-cylinder operation. Should one of the above criteria be preventing activation of the system, this is shown in the central display by the message "Stop/start inactive" and an "ECO" symbol with no frame. In the two more performance-oriented driving modes "S" (Sport) and "M" (Manual), the stop/start function is always deactivated. If required, the driver can also switch it off while in "C" mode as well. In this case neither a "stop/start" nor an "ECO" symbol appears. A generator management system makes a further contribution to fuel economy: whenever the V8 engine is on the overrun or when braking, kinetic energy is used to charge the battery rather than being wasted as heat in the usual way. In all other operating modes a combination of onboard network and generator management enables the generator to be kept at a low voltage. This reduces the load on the engine and makes for fuel savings of around 0.15 litres per 100 kilometres according to the NEDC standard, and up to 0.2 litres per 100 km in city traffic with its frequent overrun and braking phases. All the engine functions are executed and controlled by a particularly efficient Bosch MED 17.7.3. control unit. This state-of-the-art engine computer not only controls the direct petrol injection, cylinder shut-off and variable oil supply, but also communicates with all the other onboard control units. The microprocessor has more than 30,000 different parameters and functions stored in its memory, and is able to perform up to 260 million individual operations per second. To reduce the load on the engine control unit, the eight individual ignition coils have an integral electronic module known as an ignition amplifier at each cylinder. These ensure a strong ignition spark at all engine speeds and under all load conditions. Eight high-voltage powerstages are responsible for highly precise actuation of the piezo-electric injectors. For the first time AMG is using a sports exhaust system featuring an exhaust flap on each side. This technology resolves the conflict of aims between an emotional sound when driving in a sporty manner and a more discreet engine note in the partial load range. The main focus of the sound design was on achieving a perfect synthesis of perceptible dynamism and the long-distance comfort that is a hallmark of Mercedes. Each of the two rear silencers has a flap which is variably activated on a logic-controlled basis depending on the driver's power requirement and the engine speed. At low loads and engine speeds below 2000 rpm the flaps remain closed. This causes the exhaust gases to cover a longer distance and flow through an additional damping element, so that the engine sound is pleasantly subdued and irritating frequencies are effectively suppressed – resulting in a harmonious sound impression especially in four-cylinder operation when cylinder shut-off is active. When the driver accelerates, the flaps open at an angle of 15, then 30 and up to 50 degrees so that some of the exhaust gases cover the longer, acoustically dampened distance and some the shorter distance. This produces a sonorous engine note. Under full load at higher engine speeds, in performance-oriented eight-cylinder operation, both flaps are fully opened so that the occupants are able to enjoy the decidedly muscular sound typical of an AMG V8. In short, they are left in no doubt about the performance potential of the 310 kW (422 hp) naturally aspirated AMG eight‑cylinder engine. The two-pipe AMG sports exhaust system with two chromed twin tailpipes on each side has a pipe diameter of 65 millimetres from the manifolds to the pre-silencer. The diameter is reduced to 60 millimetres from the pre-silencer to the rear silencers. 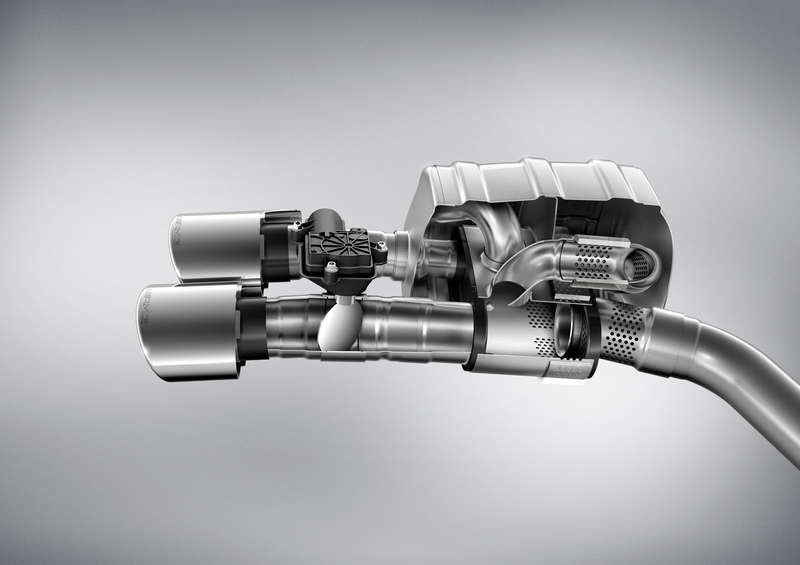 Low exhaust emissions, compliance with country-specific standards and a characteristic engine sound – the requirements for the exhaust system of the new, naturally aspirated AMG 5.5-litre V8 engine were manifold and complex. The SLK 55 AMG complies with the current Euro-5 emission standard, as well as meeting all the requirements of the US market (LEV-III standard, On-Board Diagnosis II). Air gap-insulated manifolds ensure a rapid catalytic converter response. For efficiency and to save space, this concept has a tandem catalytic converter housing on each side of the vehicle: adjacent to the firewall, two thin-walled ceramic substrates are grouped into each housing. This solution makes the previous, additional underbody catalytic converters unnecessary. The two ceramic substrates differ to ensure rapid and efficient emissions control: the front one is coated with palladium, while the rear one has a bimetal coating of palladium and rhodium. One lambda sensor per row of cylinders is located in front of each catalytic converter housing, and there is a lambda diagnostic sensor between each of the two thin-walled substrates. The lambda sensors are necessary for demand-related lambda control. In all operating conditions, the constituents of the intake mixture can be precisely controlled to avoid damaging the catalytic converters. This also benefits the fuel consumption under full load, as the mixture can be leaner than in engines without this control system. 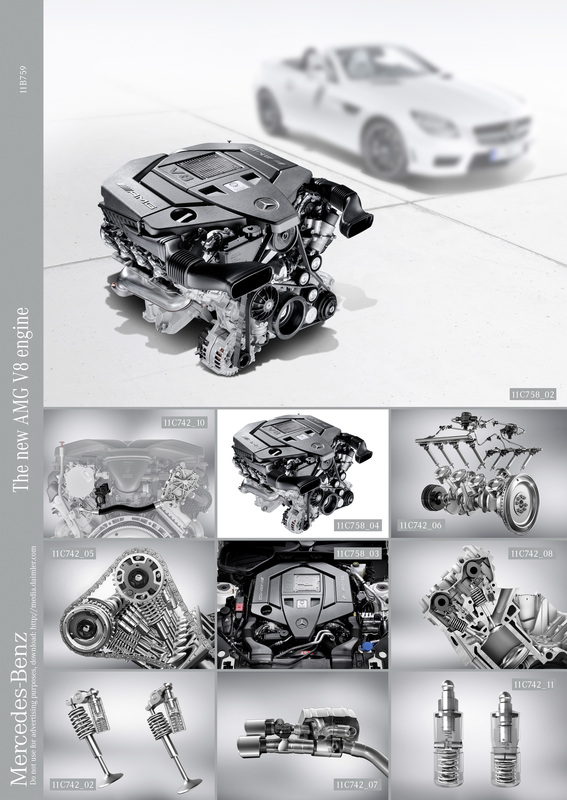 Development of the new, naturally aspirated AMG M152 5.5-litre V8 engine commenced in 2008. On the basis of the M157 eight-cylinder biturbo unit, the first drafts were calculated, designed and verified by simulation. Various model and component tests were followed by numerous test series before a concept engine was realised. The focus was on the greatest possible system availability of the cylinder shut-off function, with the aim of achieving the maximum fuel saving. 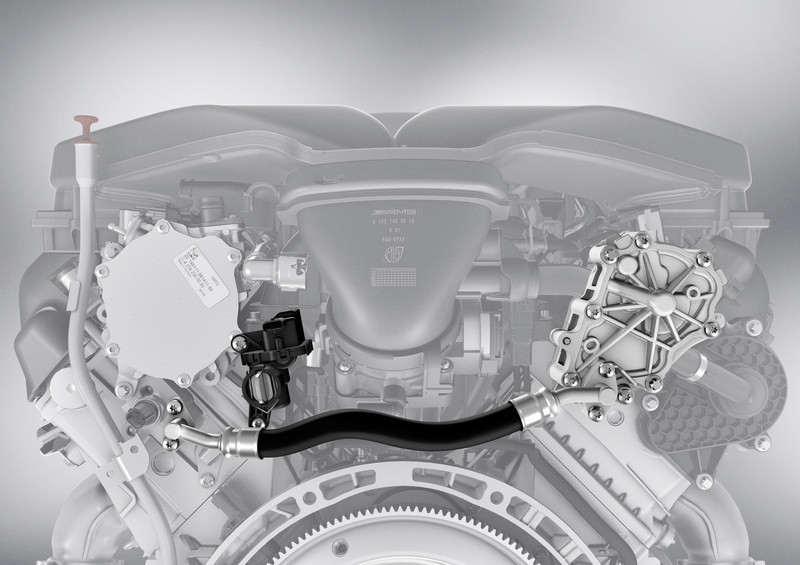 The spray-guided direct petrol injection exclusively developed by Mercedes-Benz Cars and also used in this new AMG V8 engine made a valuable contribution. 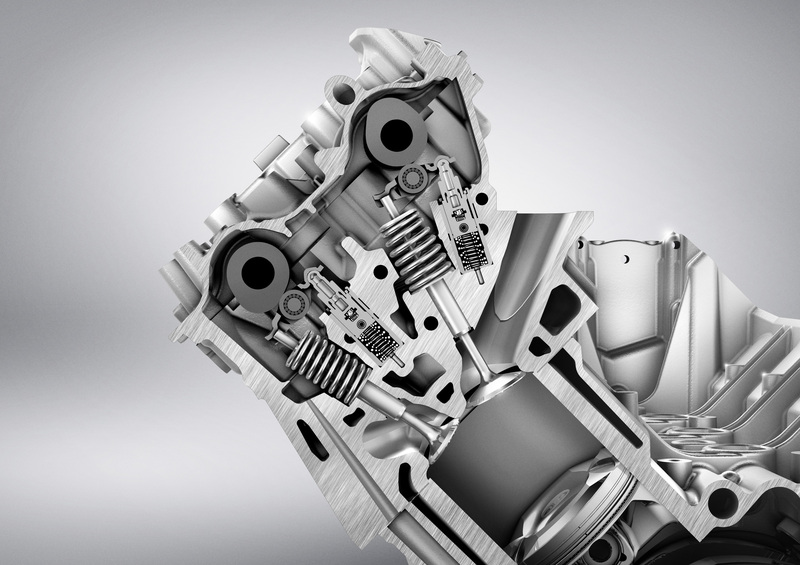 During the conceptual phase for the M152 the AMG engine specialists concerned themselves with fundamental packaging trials, especially concerning the placement of the selectable compensating elements for the cylinder shut-off function. The design of the intake and exhaust ducts was decisively influenced by the compensating elements, the aim being to make best possible use of the installation space in the cylinder heads to achieve the maximum output and torque yield. Configuration of the camshaft sections was also a central consideration. The challenge was not only to achieve the desired output and torque figures, but also to realise a durable, dynamic valve drive with the selectable compensating elements despite the high engine speeds of up to 7200 rpm. 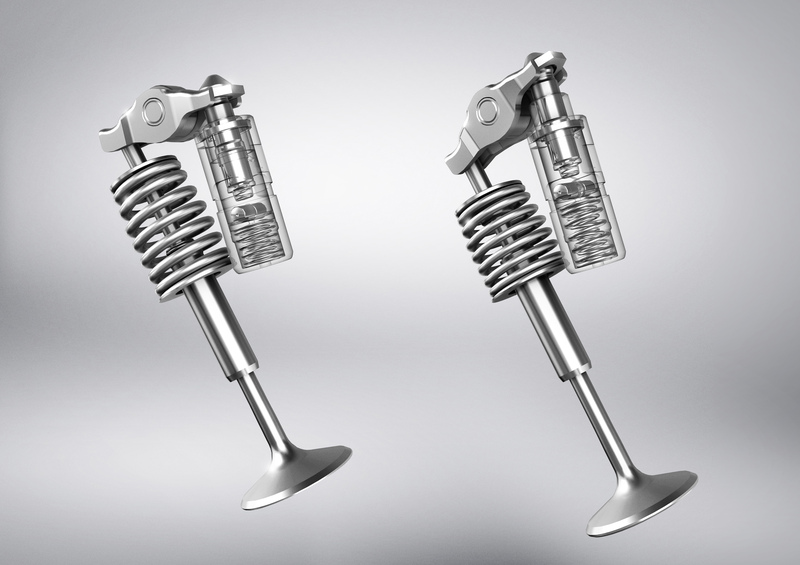 In addition to extensive simulations of the valve drive system, tests were conducted on the cylinder head test bench to assess the dynamic properties of the valve drive before it was used in a finished internal combustion engine. Further component tests for the AMG Cylinder Management system were carried out using a perspex cylinder head. The AMG developers used this to analyse the complex system of oil supply ducts and selectable compensating elements in a wide range of operating conditions, e.g. when starting or at high engine speeds. This enabled extraneous influences such as air entrainment into the oil circuit to be easily identified for optimisation of the system. Only after the component tests was the cylinder shut-off system tested and verified in a complete engine on dynamic simulation test benches. The M152 presented a further challenge – verifying the performance of an engine which is strictly speaking a combination of two engines: a four-cylinder and an eight-cylinder. During the development process a large number of parameters such as injection quantities, injection times and camshaft adjustment in four and eight-cylinder operation had to be examined. The transition between the two operating modes must only occur when the camshafts are not "biting", and the selectable compensating element is not under load. The behaviour of the deactivated cylinders was also continuously analysed. The Mercedes-AMG test bench facility houses nine high-tech test benches, allowing dynamic testing of engines with an output exceeding 470 kW and more than 1000 Nm of torque. These test facilities are able to simulate any road and environmental conditions to reproduce any conceivable type of operation. Cold or hot starting, mountain passes, stop-and-go traffic or fast laps on the North Loop of the Nürburgring – the engines are required to give their utmost. Even the intake air temperatures and densities can be varied by computer control, and the engines can be alternately filled with hot and cold coolant. Fuels of different grades are also available. The goal of the detailed bench tests was to verify the performance of all the engine components, including the peripheral units. All the measurement data for the engines examined were systematically compared, and evaluated using reproducible test methods. The functioning tests were accompanied by endurance testing: to ensure the very highest quality standards over their entire operating life, the new AMG V8 engines were required to undergo 8000 hours of endurance testing. At the same time the first test engines had to prove their worth in practical trials. The AMG engineers paid painstaking attention to the cylinder shut-off function, the stop/start system and the exhaust flaps. A wide range of operating conditions was chosen to ensure that the individual functions operate at a high quality level. Whether in the icy cold of northern Sweden, the merciless heat of Death Valley (USA), lapping the high-speed circuits in Nardo (Italy) and Papenburg or in stop-and-go traffic – the standardised test programme of Mercedes-AMG includes all climatic zones and route profiles. At the same time it makes the very highest demands on the day-to-day practicality, reliability and long-term durability of the new engine/transmission combination. 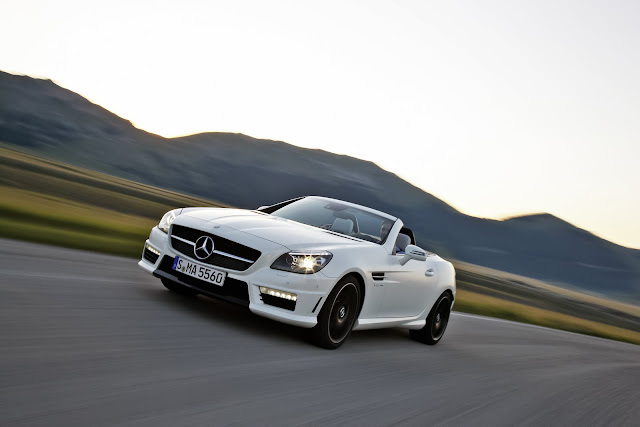 The SLK 55 AMG test cars were taken on extended stop-and-go journeys in a number of large cities. This enabled the interaction between the different engine and transmission control units to be painstakingly examined, as well as the influence of the ambient temperature on the operating modes of the new V8 engine. Another major focus was on the vital further development of the control software, and its constantly necessary application to the different onboard systems and environmental requirements. Like all other AMG engines, the new, naturally aspirated eight-cylinder is assembled by hand in the AMG engine shop taken into commission in 2002. Highly-qualified technicians assemble the M152 according to the "one man, one engine" philosophy, maintaining the very strictest quality standards. This painstaking care is attested to by the signature on the characteristic AMG engine plate. 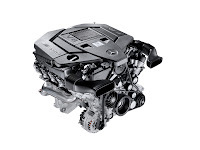 Powerful eight-cylinder engines are an inseparable part of AMG's corporate history. Established in 1967, the company immediately caused a stir with the 300 SEL 6.8 AMG which succeeded in taking second place at the 24-hour race in Spa-Francorchamps (Belgium) in 1971. The AMG racing saloon was technically based on the Mercedes-Benz 300 SEL 6.3 with the M100 V8 engine. With an engine output of 184 kW (250 hp) at 4000 rpm and a top speed of 220 km/h, this luxury V8 saloon with the M100 V8 engine was Germany's fastest regular production car at the time. Classic tuning as well as an enlarged displacement from 6330 to 6835 cc resulted in an increase in output to 315 kW (428 hp) at 5500 rpm and in torque from 500 to 608 Nm. Another important engine in the AMG story was the M 117, its first eight-cylinder unit with four-valve technology. With a displacement of 5.6 litres, 265 kW (360 hp) and 510 newton metres of torque, this V8 accelerated the 300 CE 5.6 AMG to a top speed of 303 km/h in 1987. This made the coupé the fastest German car in series production, and American fans reverently christened it "The Hammer". The supercharged AMG 5.5-litre V8 of 2001 is another milestone in the history of AMG engine development: the M113 K delivered up to 428 kW (582 hp) and a torque of 800 newton metres. The supercharged AMG 5.5-litre V8 of the SLR McLaren dating from 2003 was even more powerful – the M155 generated up to 478 kW (650 hp) and 820 newton metres. 2005 saw the debut of the naturally aspirated, high-revving AMG 6.3-litre V8 engine known as the M156, which developed up to 386 kW (525 hp) and 630 newton metres. In the new C 63 AMG Coupé this eight-cylinder in combination with the Performance Package delivered 358 kW (487 hp). 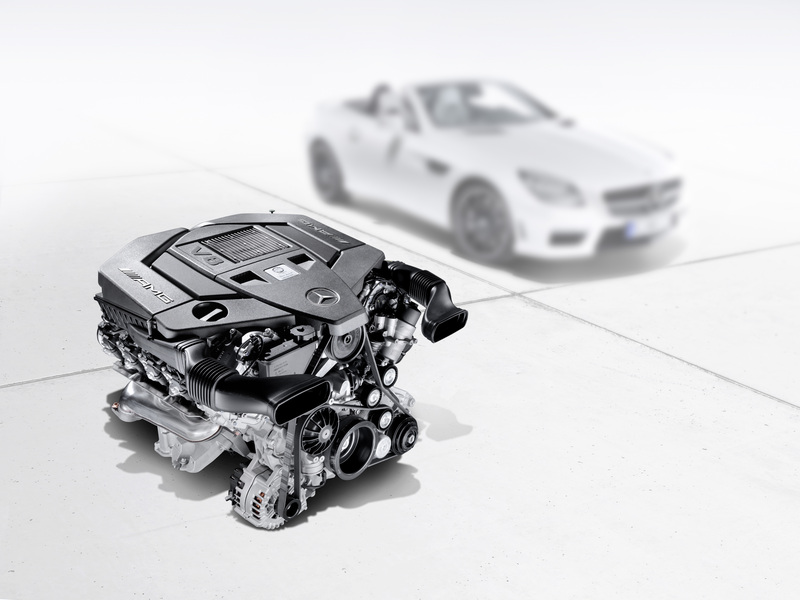 From 2005 to the present more than 68,000 M156 engines have been produced – a record in the history of AMG. Exclusively reserved for the SLS AMG, the M159 likewise has a displacement of 6.3 litres and delivers a peak output of 420 kW (571 hp), with a maximum torque of 650 newton metres. Closely related to the new M152, the AMG 5.5-litre V8 biturbo engine delivers between 386 kW (525 hp) and 420 kW (571 hp) depending on the model, and a maximum torque of between 700 and 900 newton metres. 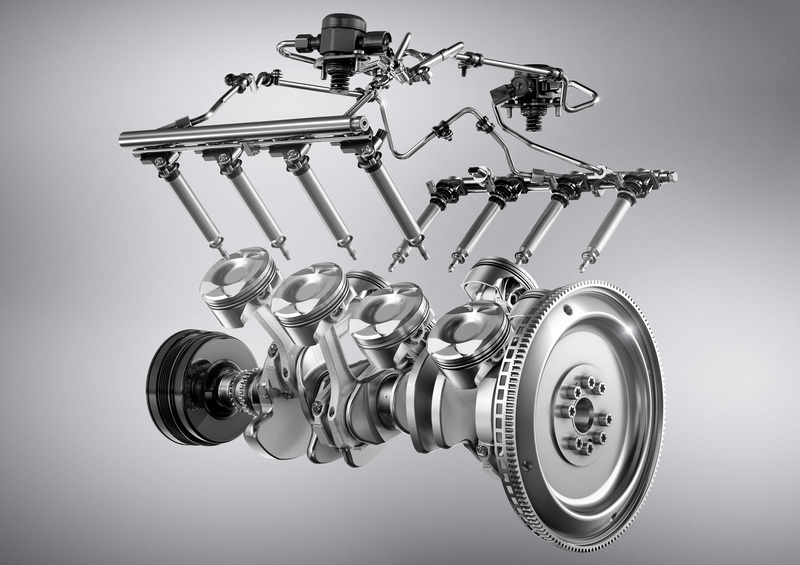 The M157 is regarded as the most efficient engine in its output and displacement class. The combined NEDC fuel consumption of the E 63 AMG is only 9.8 litres per 100 kilometres. The supercharged AMG 5.5-litre V8, the AMG 6.3-litre V8 and the AMG 6.0-litre V12 biturbo were all able to win the Best Performance Engine category several times in the International Engine of the Year Awards.